As a part of a media team (which I was surprised to be a part of as I never thought bloggers as media), I was invited for an entertaining evening by a new broadband powerhouse in Malaysia, which goes by the name P1 Wimax. This is the same P1 Wimax which I have mentioned before in my earlier post which had allowed me to test one of their product which is called a Wiggy. I had stated in that post a bit of frustration in their service but as a person, I love how they do their public relation. They seem to hit all the right button with the media in trying to promote their new business. They have just turned 1 year old yesterday and I think they can be a company to be reckoned with in a few years (not that they are not now but it is too early to tell). Anyway, the event that they invited me too was a very unique event. 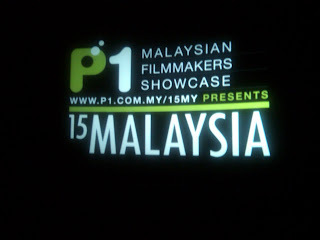 It is the showcase of 15 films (14 actually as 1 did not finished on time, yet) which were commissioned by P1 Wimax to coincide with the independence day of Malaysia on 31st August this year. These films are only available online. The brainchild of a singer, writer and patriot extraordinaire, a guy by the name of Pete Teo. He was the man behind another Malaysia unity project by the name of Malaysia Artist for Unity or MAFU and as was told by the CEO of P1 Wimax, Pete approached them 8 months ago and proposed this idea. P1 Wimax commissioned them and yesterday all were unveiled (except one) and we were treated to the shorts in an IMAX theatre. The idea of making 15 short films by extraordinary directors, accomplished in their own ways. Some are known by Malaysian but some are only known outside of Malaysia. The pictures above are combo pictures of them and I think most would love to be known for the films they have done for this project. All I can say is that video was painfully funny. Is it important to have HugeFollowing on Twitter? District 9 : Apartheid as the background?